Results with this cookbook have not been consistent. I have to admit it was not a good purchase and get rid of it. The recipes in this are good, but, even better, the technique adapts itself well to experiementation. The chart in the front of the book detailing different grains and their respective liquid quantities is a great jumping off place. I've made dozens of fruit/grain concoctions for breakfast using this template. Fast and foolproof. This was really good. I used beefsteak tomatoes and salmon, and found it to be very flavorful and easy! I didn't love this. It may have been better if I had used a thinner yogurt for the tandoori topping (I only had Greek yogurt) but still it didn't work for me as a combination. On paper rice, salmon, kale and butternut squash with a tandoori sauce sounded good but in reality it was actually dull. Very good, but I recommend leaving out the cloves. I used less than half of what the recipe calls for and the clove flavor was still too strong. Maybe a little less cinnamon as well. I doubled the quantity. Fast and easy to do. Nice thai flavours. I'm ready to give up on this cookbook. It's a nice idea, but you simply cannot cook all of these things in one pot and not expect something to be overdone or underdone. It doesn't work! Donating to the library book sale. This was a good meal that seems to call out for pasta. I would omit the broccoli or serve it on the side as there is no way not to overcook the broccoli when using this method. 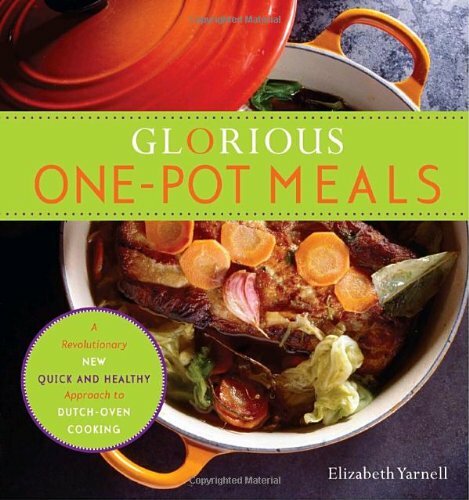 Elizabeth Yarnell developed her revolutionary infusion-cooking method to avoid often mushy slow-cooker results and to make cooking and cleaning up after dinner a breeze. Now anyone with too many tasks and not enough time can use her technique to get dinner on the table in an hour or less, with no more than twenty minutes of hands-on prep work--and just one pot to clean. All it takes is a Dutch oven and a few basic fresh or even frozen ingredients layered--never stirred. Glorious One-Pot Meals provides the most convenient method yet of serving highly nutritious, satisfying suppers every night of the week.